We are offering PTFE Lined Reducer to our clients. VescoaT supplies and manufacturer of FEP / PFA Lined Reducer of various Standard, Non Standard size on Request, We also manufactures in PFA / FEP / HDPE lined Reducer in Both Concentric and Eccentric Based on Application and international standard of ASTM F1545. 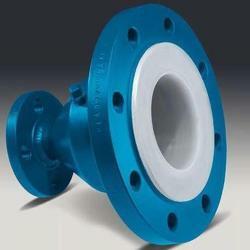 - Standard : Two fixed flanges. We are a top-notch organization, engaged in providing PTFE Lined Reducer. 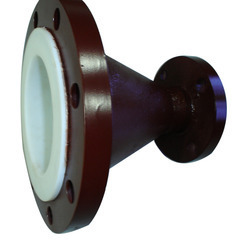 PTFE Lined Reducer, for Chemical Fertilizer Pipe, Size: Upto 12"
- Hi-Tech Lined Pipes can be supplied with fixed or loose flange design and any drilling specification up to 8" NB sizes. - Jacketed Lined pipes are also available as a solution to customer's typical applications. We are the leading manufacturer or exporter of fitting services. Our expertise of this industry has enabled us to offer a gamut of PTFE Lined Reducer.